Vermont U.S. Sen. Bernie Sanders speaks to supporters Friday, April 12, 2019, at James Madison Park in Madison, Wis. It was Sanders’ first stop in Wisconsin during his 2020 presidential campaign. He won Wisconsin’s Democratic primary in 2016. Photo by Shawn Johnson/WPR. 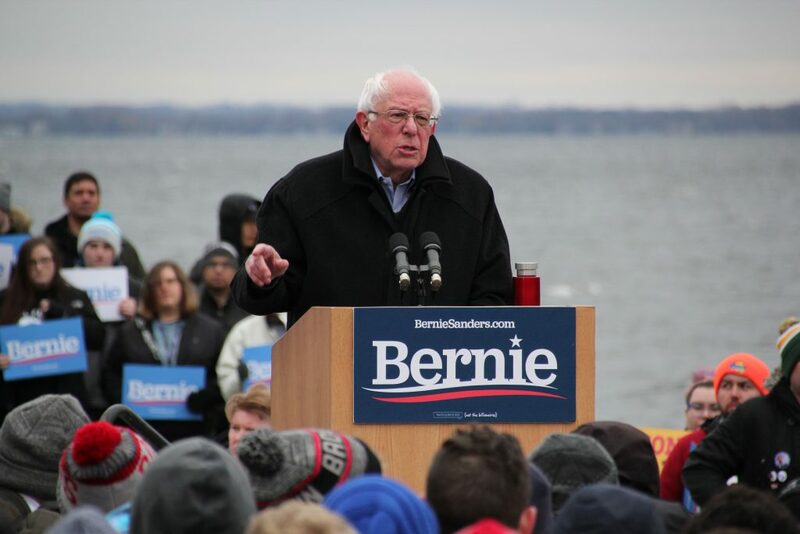 Democratic presidential candidate Bernie Sanders told a shivering crowd of a couple thousand people along the shores of Madison’s Lake Mendota that he needed their help to complete a political revolution. 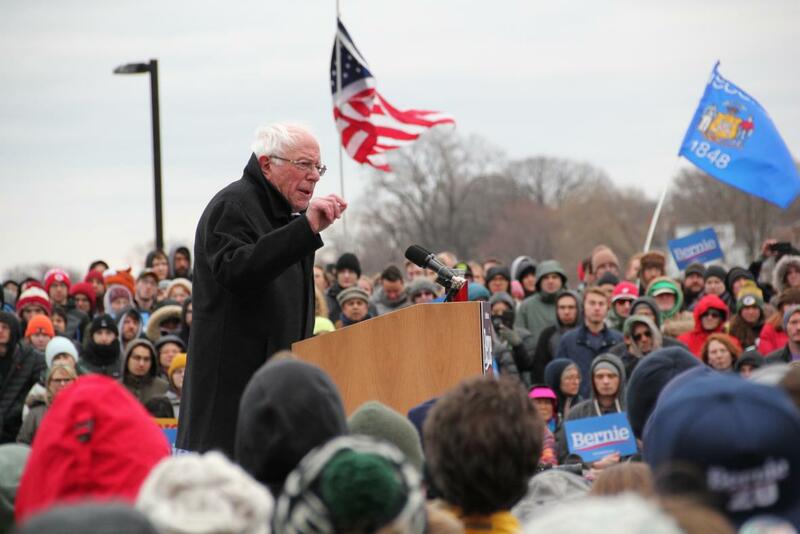 Friday’s rally at James Madison Park was the first visit to Wisconsin this year for Sanders, a U.S. senator from Vermont. He also plans to campaign this weekend in Indiana, Ohio, Michigan and Pennsylvania, all states Trump won in 2016. “Together, we are going to make sure that that does not happen again,” Sanders said. Sanders called Trump a “pathological liar,” saying the biggest lie Trump told in 2016 was that he would stand up for working people. “Our job in this campaign is to reach out to working families who are hurting and to work with them to finally create a government and an economy that works for all of us and not just the ‘one percent,” Sanders said. While he came up short nationally in his 2016 run for president, Sanders won Wisconsin’s Democratic primary overwhelmingly that year. He defeated eventual Democratic presidential nominee Hillary Clinton by a margin of 13 percentage points here, or about 135,000 votes. Sanders also won seven out of Wisconsin’s eight congressional districts. Four years ago, he was effectively the lone alternative to Clinton, who was favored by most of the Democratic establishment. This year, he’s one of several candidates making the case that they’re best equipped to bring dramatic change to Washington. Despite wind chills that dipped into the 20s Friday, Sanders spoke at length about issues he said were considered “too radical” in 2016 that are now being embraced by progressive candidates across the country. He said those included the legalization of marijuana, a trillion dollar rebuild of America’s infrastructure and “Medicare For All” universal health care. Vermont U.S. Sen. Bernie Sanders speaks to supporters Friday, April 12, 2019, at James Madison Park in Madison, Wis. Photo by Shawn Johnson/WPR. “He speaks to everything I believe in,” Wilcox said. Thomas Schlenker of Milwaukee said he voted for Sanders in the 2016 primary. He said he supports Sanders’ outspoken support for universal health care and raising taxes on the wealthy. “I mean, he has the track record to prove that he’s genuine as opposed to many other candidates do not,” Schlenker said. Georgia Christman of Minneapolis is a student at the University of Wisconsin-Madison. This will be her first time voting in a presidential primary, and she said she’s still getting to know the candidates, including Sanders. While Friday was Sanders’ first stop in Wisconsin this year, he’s not the first Democratic candidate for president to visit Wisconsin this election cycle. Minnesota U.S. Sen. Amy Klobuchar visited Wisconsin in February, and former Texas U.S. Rep. Beto O’Rourke has made two stops here, one in Madison and another in Milwaukee. While Wisconsin’s primary is about a year away, early polling suggests Sanders is well-positioned to make another run at the state. Marquette Law School’s latest poll found Sanders was the “top choice” of 32 percent of Democratic voters, putting him at the top of the field. Rounding out Marquette’s April poll were former Vice President Joe Biden at 29 percent, Massachusetts U.S. Sen. Elizabeth Warren at 17 percent, California U.S. Sen. Kamala Harris at 11 percent, O’Rourke at 10 percent, New Jersey U.S. Sen Cory Booker at 9 percent, Klobuchar at 8 percent, South Bend, Indiana Mayor Pete Buttigieg at 7 percent, former U.S. Secretary of Housing and Urban Development Julian Castro at 4 percent, Washington Gov. Jay Inslee at 2 percent, New York U.S. Sen. Kirsten Gillibrand at 2 percent and former Colorado Gov. John Hickenlooper at 1 percent. 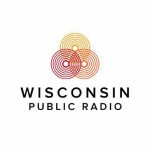 In Madison, Bernie Sanders Calls On Supporters To Help ‘Transform’ Country was originally published by Wisconsin Public Radio.